US guitarist Jason Wells has, according to his bio, become one of the most sought-after Blues and Rock guitarists in the Midwest. 'Nine Hours', his fifth recording project, provides good evidence why that may well be the case. Citing influences like the Allman Brothers, Gov't Mule, James Gang, Joe Walsh and Jimi Hendrix, this is a vibrant and enjoyable classic Blues Rock album with a strong live feel. Particularly striking is the range of textures and flavours on display across the album's ten tracks as Wells and his band (consisting of Evan Grubbs on bass, Jeff Lageveen on drums and Garry Smith on keyboards) reveal themselves to be a competent and confident four-piece with a real love for their craft. 'Warm Up 2', for example, is a crisp, energetic opener in the Stevie Ray Vaughn 'Soul To Soul' mould, whereas 'Got Me A Woman' and 'Down By The River' show off the band's funkier side and their ability to mine a groove. 'Chase The Dragon', with its driving riff, and the more dishevelled and raucous 'Move My Soul' are straightforward Rock-influenced efforts (think of a slightly impatient Ted Nugent tipping his hat to the Blues). Elsewhere, the relatively light and jaunty 'If I Was Rich and Famous' bears a strong Country influence, while 'East Moline' dips into Southern Rock with its near Honky-Tonk feel. Pick of the bunch for me though are the groove-laden 'Fooling Around', which I love despite its apparently hackneyed lyrical themes ("Let's go to town now, honey, do a little foolin' around") and the rich, slow Blues of album closer 'Waiting To Come Down'. It all makes for forty-two minutes or so of very cool listening. It's music to drink to, music to groove to and music to chill to. The rub? 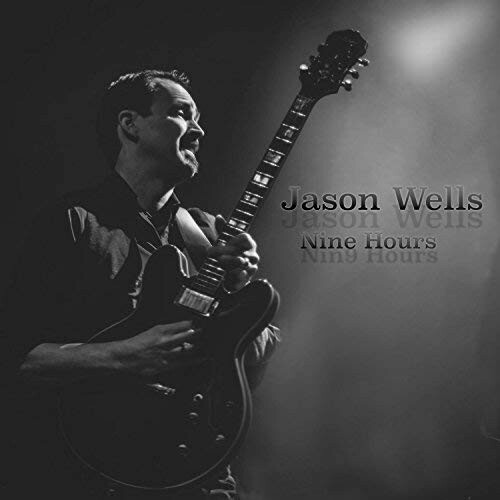 That could potentially be the fact that, in the UK at least, this style of music tends to fill pubs and clubs rather than concert halls and stadia, and while the feel of 'Nine Hours' suggests that live performance is one of Jason Wells' strengths, how far can a Blues artist go? I could tell you it's great, and some of it is, but we both know it's more of a late-night party indulgence than the next big thing. Of course, that doesn't mean it's any less enjoyable or any less worth checking out. If you dig the Blues, you'll like 'Nine Hours'.